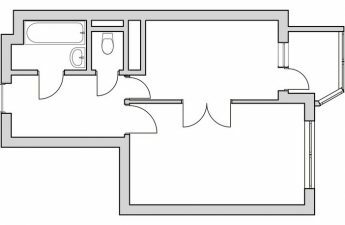 Custom layout - no reason to refuseoriginal ideas in the interior of the apartment. We offer to familiarize with one of the projects of architects Marcos Gonzalez, Beatriz G. Casares, Carmina Casajuana. 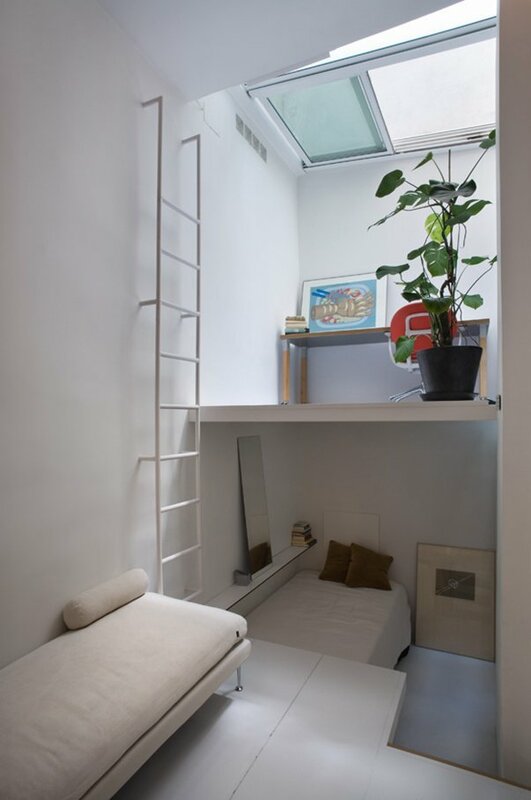 They had to design a really unusual apartment for a young Madrid bachelor: the height of the room reached 5 meters, and its area was only 21 square meters. 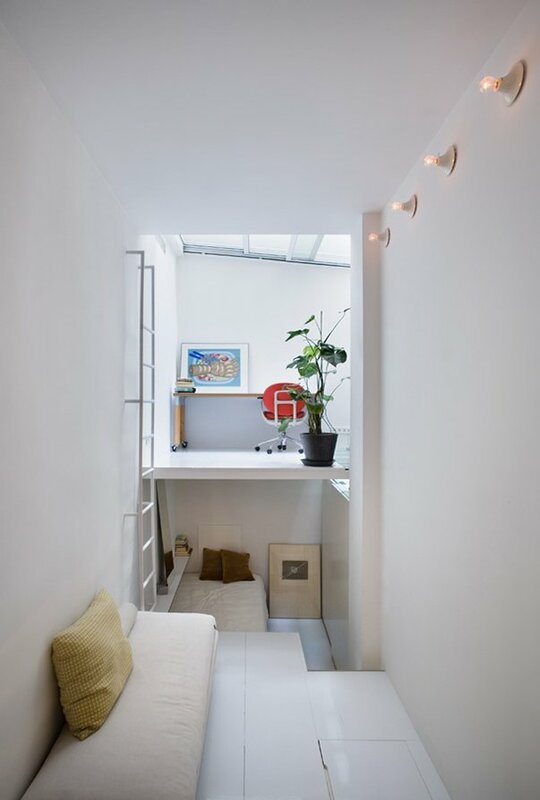 It would seem that such a high, but a small apartment can not correspond to the ideas of comfortable housing, but the original idea, proposed by professionals, showed that intractable problems do not exist. 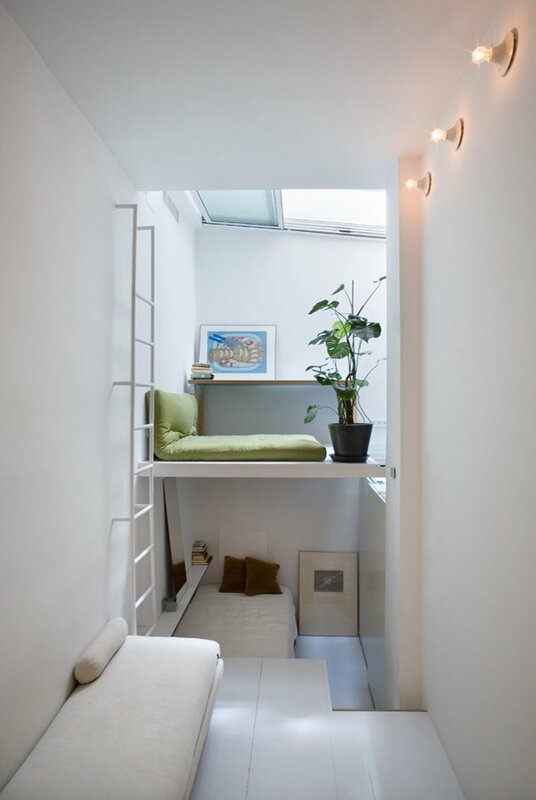 In a small apartment designers managedplace the bedroom, living room, kitchen, study and bathroom. The secret of a successful solution was. 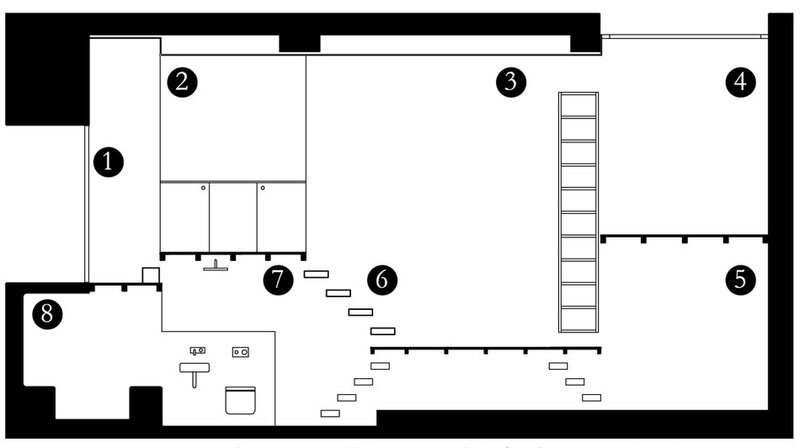 Several rooms located one above the other, are connected with the help of stairs. 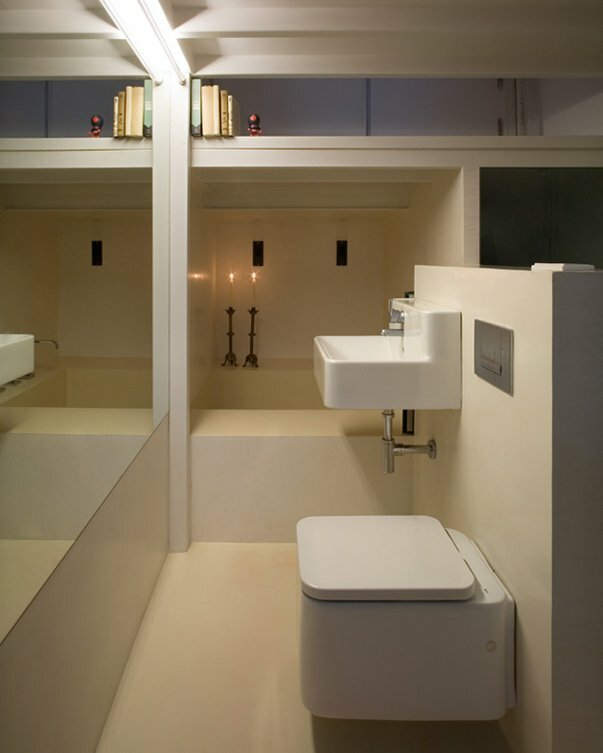 The authors of the project carefully thought out the layout of the rooms on several levels. 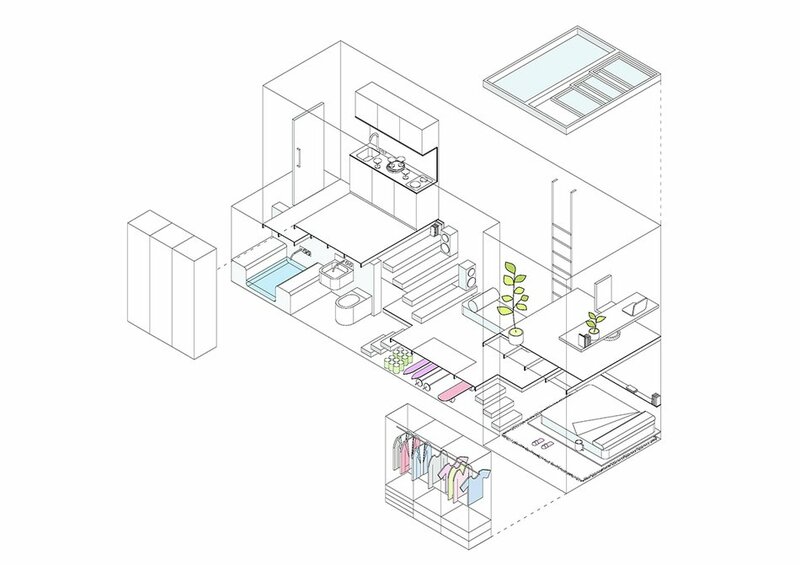 Entering the apartment, you find yourself in a small hallway, followed by a kitchen combined with a dressing room. From the kitchen you can go down to the living room, and the brightest room located at the top is used as an office or a rest room. You can climb here only by hanging stairs. 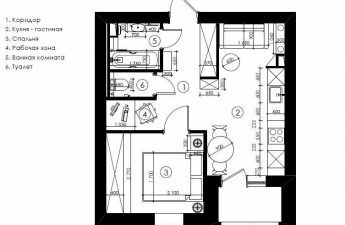 There is a bathroom on the lower level, and exactly underliving room is a pantry. Of course, the division into zones is largely conditional: the absence of walls and the same color design allows you to create a single harmonious space. not only helped to place everything necessary in a small space, but also allowed to cope with the lack of natural light. The presence of only one window made it impossible to divide the room into two full floors. 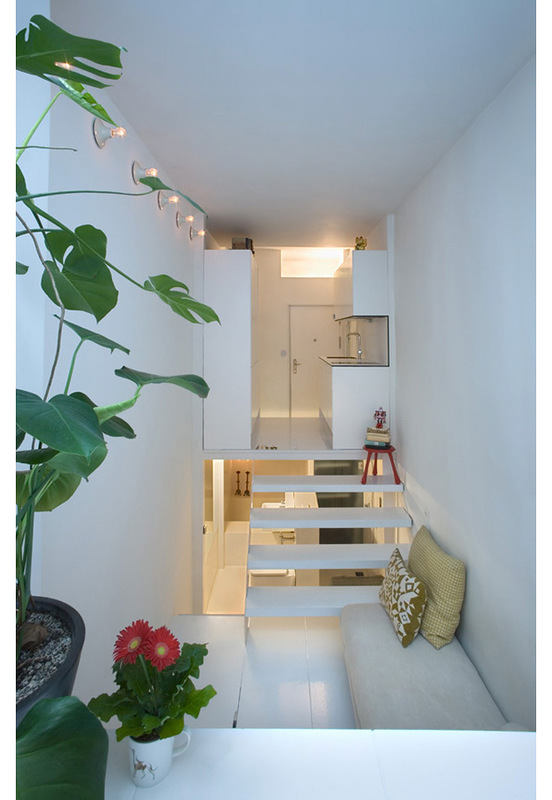 The use of white in the interior allowed to visually enlarge the space. 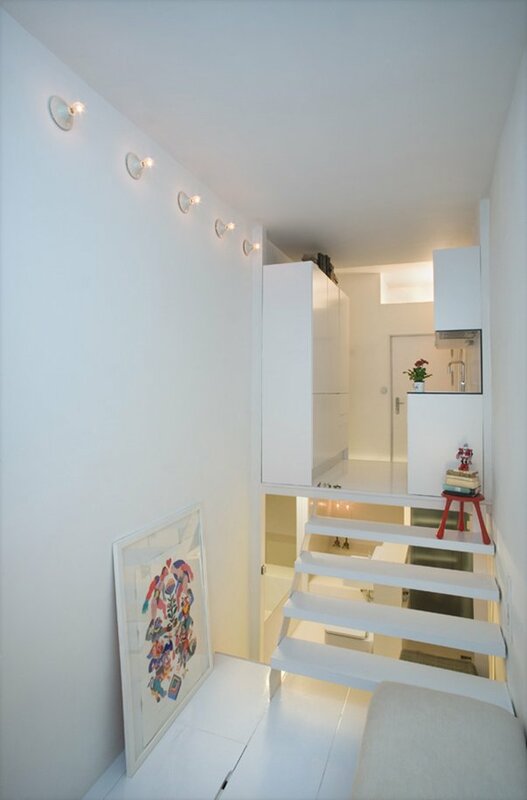 To save light on the lower levels, the designers used almost weightless stairs, consisting of only a few steps, without railings. 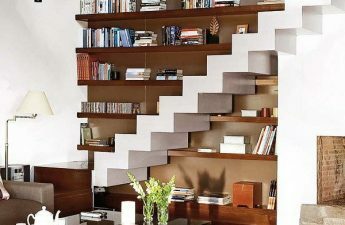 For some, the abundance of stairs may seem to be a flaw in the original layout of this apartment: in one day, the owner has to climb and descend on them an unlimited number of times. However, the owner of the new-fashioned studio, on the contrary, regards this as an excellent training. 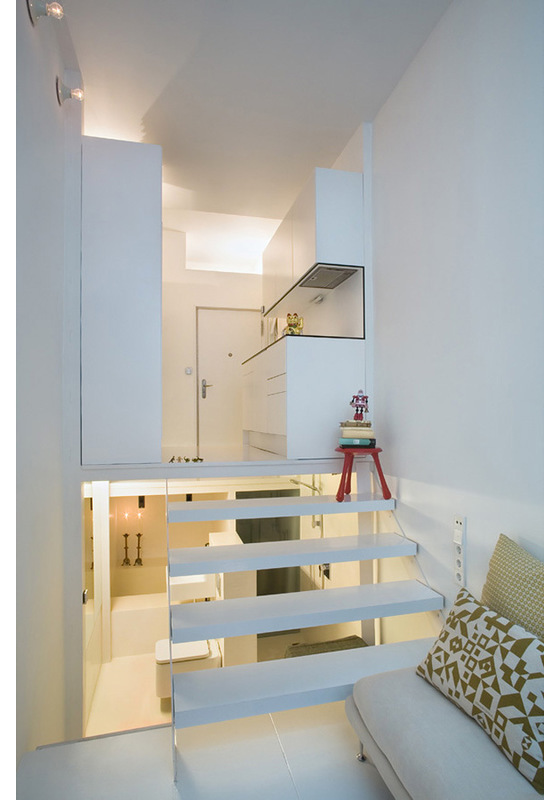 The result of the unusual decision of designers was a modern and comfortable apartment. She is not overloaded with furniture, but she has everything necessary for living a young modern man. In general, the non-standard idea to create zones at different levels allowed us to place everything necessary for a comfortable life in an uncomfortable at first glance room.